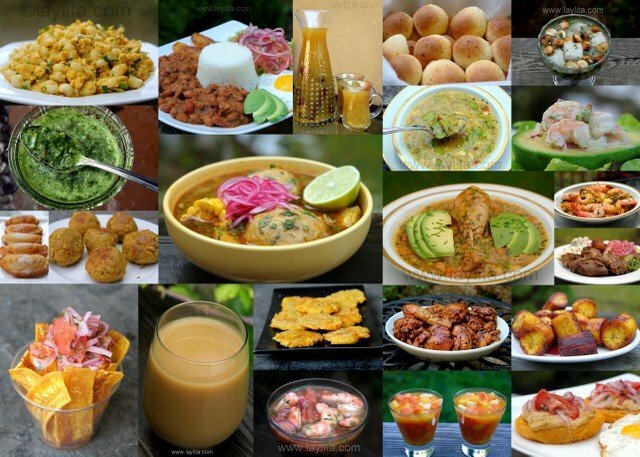 Here you will find my most popular traditional Ecuadorian recipes, including recipes from the different regions of Ecuador and holiday recipes. These classic Ecuadorian recipes are easy to make and most include step by step photos. This list breaks out the recipes by category to make it easier to find the recipe you need. Hi, I’m so glad I stop by your website, this is amazing it’s has all the authentic Ecuadorian dishes, that I would like to make N perfect and master. It funny how I ended up here, at first I was just looking for a recipe to make a simple quick breakfast, then I got curious n one thing lead to another. Crazy day , hehehe Anyways my dad is from Ecuador and I’m half Ecuadorian and Native American my mom is from here, in America and I just hope one day I would wanna make this food for family to impress them, n some day a family of my own. My mother’s ajacas are by far my favorite food. She is currently teaching me her recipe so I can pass this along. When I was in the Galapagos about 8 years ago, I was served a fish that the cooks called bacalao. But the fish was actually some kind of grouper. Later, when we visited the Amazon I bumped into an American who lived in Brazil who commented that in South America, bacalao is not just cod, as it is in Spain, but is any fish where it’s liver might be harvested for fermenting. The grouper I was served in the Galapagos, was baked or poached and delicious! Is there something unique to Ecuador or South America where bacalao is not simply cod? Hola Laylita, I am from the US but live in Ecuador, and — you might laugh — sometimes the first version I try of an Ecuadoran specialty is my version based on your recipes. My husband is Ecuadoran, but we don’t eat out very often and my in-laws are not very creative (although definitely traditional) in their eating. So, I am often left to my own devices. Your website was also a huge help when we were living in Argentina and I wanted to make a (semi-)traditional Ecuadoran meal for my husband. Thank you! There is nothing like Ecuadorian food. 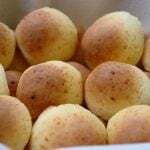 Laylita, buenas noches, por favor me podría ayudar con la receta de los quimbolitos? Gracias. What a revelation you are! Have been in Ecuador for 2 months and wanted to make sure I have recipes for when I get back to England and I found you… Beautiful appetising photos, easy recipes. Thank you. Wish you lots of success. I can’t be more excited to have found you and your site! I’ve been missing my parents cooking (I currently live in Ethiopia while my Ecuadorian parents live in Chicago), and now I can finally get back to some home cooking! Looking forward to also checking out your new cookbook ? I just want to thank you so much for making our Ecuadorian dishes so appetizing. It helps to cultivate our culture and promotes the diffusion of the huge variety of flavors. Keep up the good work!! It’s so great to find another Ecuadorian expatriate living in Seattle! Thanks for this great compilation of recipes and I’m looking forward to your cookbook release. Laylita, I first came across your blog when looking up the recipe for the Canelazo, as I work for the company that exclusively imports Zhumir Aguardiente to the US. We have certainly used it many times…so thank U! But I must say I check your blog often for fun recipes and I never know what to choose…THEY ALL LOOK SO DELICIOUS! Kudos and thank you for sharing all these great recipes!! thank you you have some amazing recipes. Thank you for having such great recipes…I had been looking for “cevichocho” and YOU had it…just like several other recipes I needed now that I am in S.A. THANKS!! I am glad a friend shared this site with me. I have been looking for some new recipe ideas and these are really appealing!! I absolutely love your website!!! Thank you for all your work and caring to share. Existe maqueño en Estados Unidos? De ser asi, como lo llaman? I just stumbled upon your website and can’t wait to start making these recipes. I have very fond memories of my travels to Ecuador and love all your recipes from there! I’m also in Seattle – can I ask where you go for the harder-to-find Latin foods for the recipes? Estoy fascinada con todas las recetas que he visto , las voy a poner en practica , muchas gracias Laylita. I love your website!! I started my first recipe book with your recipes!!!!! Can’t wait to try the melon balls Ice cubes! No sabes el gusto que me dio encontrar tu pagina web! No solo tienes recetas para muchas de mis recetas favoritas, sino que tambien tienes las adaptaciones necesarias si no se vive en el Ecuador. Estoy encantada! Y si todo esto no fuera suficiente, la pagina esta muy bien construida, las fotos estan bellisimas y parece publicada por una revista gourmet. Gracias por compartir tu trabajo con nosotros! Laylita you are a saviour, I am originally from Guayaquil and have been living abroad for the past 13 years (USA/Spain/England) and as of late I realized how much I miss Ecuadorean food. Your recipes are very easy to follow and love the pictures! Keep this going! Thank you for these great recipes. I am moving to Ecuador this year and I like to try new things so I am enjoying these recipes. I wanted to know how to cook some great dishes before I get there. I can feel a little closer to the country by eating their food while I am still here. I love everything I have tried so far. Thanks. I live in France and I love cooking and baking. Unfortunately, the only Ecuadorian dishes I know how to cook are ceviche de camaron y seco de pollo. Recently, I joined a group on facebook “latina-married to a gringo” and I realized that I miss Ecuadorian food. I had never missed it really, but since I read often the name of several Perivuan dishes (most girls in the group are Peruvian) I realized that I am missing something. I was born in Guayaquil and of course the food is a bit different but I can always follow your recipes and change the “sazon” :-) Thanks for sharing your recipes. Todas estas recetas me han hecho recordar a mi bello Ecuador, al cual no he regresado desde 1996 ya que vivo en NJ USA. Muchas gracias por publicarlas, todas estasn deliciosas y siga adelante. My wife and I retired to Ecuador almost 3 years ago. We live north of Ibarra in a small village (Tumbabiro) and are the only Americans living there. Our Spanish is limited so it is a challenge. I found your site and use it regularly, especially for our parties. Thank you very much for the wonderful recipes. Finally found you, now I will go on my quest to see if your recipes equate to pictures as well as memories of my mom’s very much loved and missed cooking. I will keep you abreast on my outcome as I am looking forward to this as well as my children . Thank you. Any suggestions ideas?.. Thanks so much for sharing your wonderful recipes and your culture! Hi Theresa – It could have been that they were too green, for the boiling method it does help if they are “pintones”, which means still green but starting to ripen. You could also try boiling for a little longer to help them soften up a bit more. Thank you so much, I think the problem was they were too green most definitely… I am going to give it another try l!!!. Thanks again! I am going to try some of your recipes, they look so delicious. I was born in Quito, Ecuador and my husband is Greek, we love making Greek and Ecuadorean dishes at our parties. However, I was not able to print any of the recipes, I would love to buy your recipe book, please let me know where I can buy it. Felicitaciones por su website porque realmente indica paso a paso las recetas de nuestra rica comida ecuatoriana felicidades de verdad. Quiciera saber si es posible hacer quimbolitos sin utilizar las hojas de achira ya que vivo en Inlaterra y es imposible conceguirlas. Muchas gracias y espero su contestacion. Hola Janeth – Se puede usar hojas de guineo (a veces las venden congeladas en los mercados latinos y asiaticos). Tambien se puede papel aluminio en su lugar o papel pergamino. Love your site — there’s a nice difference from other Latin foods. We eat a lot of hard cooked eggs so it was nice to see your suggestions. I would make one suggestion. Eggs do not have to be “boiled” to cook them. If one does boil them, at and above 212 deg F, l00 deg C, this is when they become overcooked and you can get the green color to the yolk where it borders the white. I try to get people to start calling them hard cooked rather than boiled so people will start thinking they don’t really have to be “boiled” to be safe. Eggs are safe at 160 deg F, 72 deg C and above. The higher you go, the more likelihood you’ll get the Green Monster Ring the closer you are to and above the boiling temperature. Because eggs are dense, you have to keep them in the 160-180/ 72-80 degree zones but NOT above. As soon as water begins to simmer, showing the little bubbles in the water, that is hot enough. Put a lid on them, turn off the heat and leave for 10-15 minutes. Done with no Green Ring Monsters. A little salt in the water is said to help with the peeling. I don’t know because I do them in my pressure cooker and have NO problem with shelling even the freshest of eggs. But that is a lesson for another day. I’m getting light-headed from this soapbox so I’m over and out. Thanks, Judith – That’s actually how I cook eggs: put them in the water, bring to a boil, turn it off and let them rest for 15-20 minutes. I think it’s just more of habit to call them “hard boiled eggs” even though they aren’t technically boiled. I just found your web site. It’s beautiful and I’m anxious to try some of your recipes that I remember from my 2 years in the Peace Corps in the coast of Ecuador in the early 1960’s and that I’ve eaten on return trips, especially the humita casserole. I found your post on pinterest and as an Ecuadorian living abroad all I have to say is thank you!!! 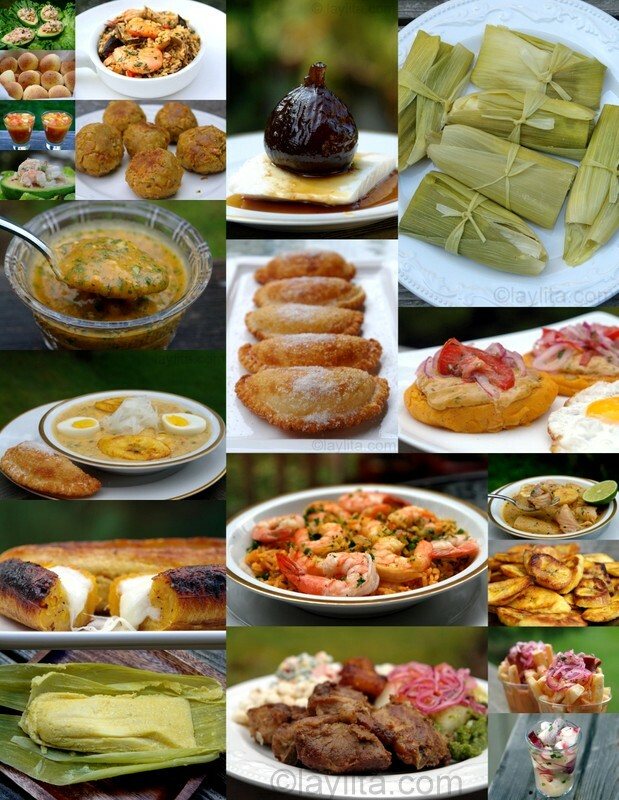 You are the first food blog I’ve found showcasing Ecuadorian food the right way. I wanted to let you know, I found your site while researching recipes for my blog, which follows my efforts to cook one meal from every nation on Earth. Every recipe I used for the week came from your site! It was really hard to decide what to use because it all looked so delicious. I’ll be posting the entry tomorrow and I gave you much kudos and a link back to your website. I hope my readers will stop by and see what else you have to offer. Your blog is really wonderful! Thank you! Hi Laylita, I love your blog! I was wondering if you had a recipe for quimbolito? I can’t find any good recipes/desciptions online. Thanks so much! Quimbolito recipe is coming soon (I know I keep saying that, but it’s for real this time). Felicitaciones por tu website. Tienes por si acaso alguna receta con uvilla? No, pero es una excelente idea! P.S- Our 3 yr old daughter is named Leilita. Estoy muy emocionada que encontré tu blog. Mi esposo es de Guayaquil y le extraña mucho la comida Ecuatoriana. Yo puedo cocinar algunos platos, pero estoy emocinoada probar tus recetas. Parecen tan ricos! Recién mi suegra me regaló unas cazuelas. Tienes una receta para la cazuela de pescado o cualquiera cazuela? Cuando fui a Ecuador con mi esposo el año pasado, la cazuela era uno de mis platos favoritos. Gracias por tu blog! I really really really would like a recipe for a “cazuela de mariscos”. Please!! For sure, it’s on my list of recipes to post. Finding your website is a Godsend and I must confess a tad bit bittersweet for me. I lost my mom in 2004 as a result of multiple myeloma. Along with her transition, I lost touch with my Ecuadorian roots, especially the food. I have two sisters, but try as they might (God bless them), their attempts at recreating dishes that mom used to make does not come out tasting, or looking, the same, I’m sorry to say. I wish I had spent more time in the kitchen with mom, so that her recipes could’ve been passed down to me, but coming across “Laylita’s Recipes,” and seeing all the Ecuadorian recipes, well, it has me feeling a bit giddy and brimming with anticipation. I’m married to a wonderful Chinese woman who cooks great, but cold wintry days in NYC leave me reminiscing for a steamy, deep bowl of mom’s “sopa de queso.” That wonderful brothy smell of cilantro (or culantro), papas, noodles, and cheese, boiling in the pot is forever etched in my heart and soul. I’ve scoured the web & youtube, but have come up short. Have you come across this recipe? Hi Rick – Thank you for your comment, glad to be able to bring back some memories of Ecuador (though sorry about the sad memory of your mother’s loss). The sopa de queso is also known as sopa de fideos, I don’t have a recipe posted, but it’s very similar to the locro de papas (https://www.laylita.com/recipes/2008/01/08/locro-de-papa-creamy-potato-soup-with-cheese/), just use half of the amount of potatoes, also cut them into small cubes, and add some crushed fideos or noodles when the water starts to boil. Don’t mash it the way a locro de papas is mashed, but just cook until the potatoes and noodles are tender, then add the cheese and cilantro. You are right it’s a great soup for cold days, I’ll add it to the site one of these days, but in the meantime I hope this helps. Saludos! Thanks for the quick reply, Laylita. Sopa de fideos! That’s right! That’s what my mom called it. I changed the name to “cheese soup” because that’s what I remembered most about it and then translated it back to sopa de queso. No wonder I couldn’t find much about it on the net. LOL! I looked over the locro de papas recipe and yes, the ingredients are very similar to what I remember my mom using in making her savory soup; down to the mozzarella cheese and the use of achiote which gave the soup a hint of an orangey tint. I remember my mom would also add Philadelphia cream cheese to the soup, which I didn’t see listed in the locros recipe. Perhaps it’s a regional thing as my family is originally from Guayaquil. Thanks so much again! This weekend – my gander as sopa de fideos. Some time after that — sango de camarones, caldo de bola & seco de pollo. BTW – what’s the difference between culantro and cilantro? They look different, but smell very similar to me. Culantro and cilantro are the same, just different names. In Ecuador, it is common in some places to call it culantro. Also, in general in Ecuador they let it grow more (to the point that you get the thin little ends), while in the US cilantro is harvested at a younger growth. This changes the look, but also the taste, the older style cilantro in Ecuador has a stronger taste. In the US you can sometimes find it this way at the farmer’s market. Culantro and cilantro are different, and we have both of them here in Ecuador, although they are used interchangeably. Cilantro is what is commonly sold in the market (although it is called culantro throughout the country). Thank you for the explanation of the more mature growth to the point of flowering having a stronger flavor than the young growth. Culantro is actually what is known here as wild culantro or culantro silvestre. As can be seen in the wikipedia articles and photos, they are different. But undoubtedly have similar fragrance and flavor. Thanks for posting the recipes. I now have a guidebook for cooking ecuadorian food here. Mmmm…. Hi Estefania – Tamales lojanos is on my list of recipes to post, we made them over the summer in Ecuador and I just need to make sure that I can replicate them as close as possible here in the US. All of your recipes look so delicious! I showed my grandmother (who is Ecuadorian) your vegetarian ceviche, and she was so impressed! I was hoping to find a recipe on Huevitos Faltriqueros, but I couldn’t find one. I wanted to submit a request for them in hopes that you add it to your recipes of desserts :) Thanks! Hi Kass – I have Huevitos Faldiqueros on my list of recipes to post (one of these days)! 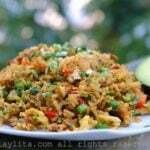 I stumbled upon your blog when I was trying to find a recipe for Ecuadorian Fritada. I lived in Ecuador in 2011 and I miss it so much!! I made your Fritada recipe and it tasted just like I was back at a little store front near my old apartment where I would get Fritada about 3-4 times a week! I was so shocked at how well it turned out! I refer to your blog quite often now. Thank you so much for sharing your wonderful recipes! !